Keller & White’s Summer Program! Take advantage of summer time to prepare for the AUGUST SAT and the OCTOBER SAT as well! Our program begins on July 16th. Scroll down or click here for more info. Need Help Making a Plan? As always, you can call (732) 530-3471 or email us at pckeller@satgameplan.com for more information. For the third year, the College Board is offering an SAT in August. For students who are available, summer is the ideal time for SAT preparation. 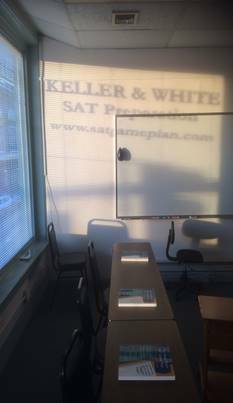 Keller & White is happy to offer our Summer Program. This program meets on a collection of Tuesdays and Thursdays, leaving your summer weekends free -- for college visits! 2. Rising Juniors who have finished Algebra-2 and are looking to get an early start on their testing. And by preparing in the summer, they will also be ready to shine on the October PSAT (which juniors DO take). Section A will meet from 9 am – noon. Section B will meet from 6 pm to 9 pm. Each of these sections is contingent on sufficient enrollment. We do expect sufficient enrollment – there usually is – but if you are interested, please register promptly so that we can make a firm plan. Tuition: We are continuing to run our Summer Discount! The tuition for the full program will be $1200, which is a $200 discount from our usual course fee. This still includes all books and materials. A deposit of $500 is due when you register and the balance is due on the first day of the course. If this is your second child to take our class, we are glad to have you back and happy to give you a 10% discount. This counts for twins too! If this is your third child with us, the discount is 20%. If it’s your fourth (and yes, some families keep sending them!) your discount is 30%. For anything more than four, give us a call. One More Summer Discount – Early Enrollments!!! We are offering a 10% discount for students who register for our summer class by June 1st. And yes, that discount may be combined with other discounts. So for example, if this is your third child in our class and you register by June 1st, then your combined discount for the summer class would be 30%. 1. We do ask our students to do 2 – 3 hours of homework each week. To get the best results, we need our students to do that work. You’ll notice that we do not offer any guarantee. We only control part of the equation. Make sure that your son or daughter really wants to do this and understands the work required. 2. Please check your calendar. As part of our commitment to small classes, we cannot allow students to attend sections other than the one in which they are enrolled (unless another student wants to switch places with you for that session). Note: as a reference for our current students, this is the schedule for our class for the May SAT. This class is closed to new registrants. Seeking help with your college essays? Ask Mrs. Keller! Essay Philosophy and Pointers HERE. The New SAT Game Plan: For 2016 and Beyond!